I begin by describing how I was an Oxford graduate, working mother and Times journalist who went from feeling mildly anxious to being completely unable to function three days later. I was married with two children and a husband who worked at Goldman Sachs. I didn’t know that this kind of depression could happen so swiftly, least of all to someone like me. This anatomisation of a privileged high-achiever’s sudden descent into mental illness is new and terrifying to read about. I then describe my slow climb to recovery, through drugs, prayer, my family’s love and especially the healing power of poetry. I analyse in depth why poetry can be a huge comfort to someone with depression. Poetry is free and has no side-effects. As well as my personal story, the book is also an anthology of consolatory poems. Seven months later, I seem to be fully recovered. I return to my normal life, working full-time until I get pregnant with our third child, then I become a full-time mother, and have two more children. Years pass, but my anxiety levels remain high: now I push myself hard to be the best mother I can, as well as wife and homemaker, while still feeling I should also work. I still have not made peace with trying to “have it all”. I succumb to a second collapse even worse than the first. In the last quarter of the book I describe my journey from containment to change. I embrace therapy and gain insights about myself and my past behaviour, about the need to challenge my own expectations and those of society about a woman’s role. Poetry becomes even more important to me and I get involved in making a poetry app. I attempt to be a different, good enough person. In the words of George Herbert, my ‘shrivelled heart’ has ‘recovered greenness’. Still married, with five healthy children, and a new future ahead - this for me has become the meaning of “having it all”. "This book is written straight from the heart of darkness. Amazing." "Rachel Kelly has written with bracing honesty and considerable courage about her own struggles with depression. She tells of both her own travails and the solutions to them, and her book will be immensely helpful to others in like circumstances." "A poignant and powerful description of one woman’s journey through the abyss of depression, how she found solace in poetry and the inner strength to recover. This book offers hope and inspiration to anyone whose lives have been touched by mental illness." "A revelatory read and alchemical tale of persona transformation: Kelly turns the lead of depression into the gold of emotional health. Art, in this case poetry, is movingly shown to be a royal route away from depression." "An outstanding piece of work. I have never read anything so suitable for us to recommend to patients who have some form of diagnosis of depressive illness." "Rachel vividly and movingly describes the profound impact mental illness can have, not only on the person suffering but all those around them... But what makes Black Rainbow special is that it isn't just a beautifully written exploration of the ravages of depression. It is also a hymn to the power of poetry to provide solace and a rich, inspiring resource for anyone who is coping with the challenges that life brings... not just maintaining mental health." "In this book, she tells her story vividly... It will be of enormous use to sufferers: it is both practical and inspiring." 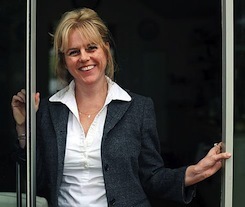 "Kelly writes with honesty, lucidity and directness… Her poignant book ends with much good, practical advice and all proceeds from the book go to the charities United Response and Sane." "Kelly writes with honesty, lucidity and directness about an experience which her heroic husband, in the afterword, describes as a ‘car crash’. ..Kelly's poignant book ends with much good, practical advice. Michael Gove might hand out this memoir to angry teachers, for it confirms what we always suspected: the right poem can penetrate a ‘heart that seemed as unfeeling as stone’. " "...a gripping and moving read…Miss Kelly writes with persuasive power about depression’s many-pronged attacks." "It’s a book we should all read, especially women, and especially those of us who have, like me, had their own struggles with what Winston Churchill (another sufferer) called the Black Dog… Women, especially those with new babies, exhausted from pregnancy, sleepless nights and the sheer shock of motherhood, are often consumed with fear bordering on terror. That’s what depression is, and if it applies to you or your daughter, take heart. Help is available. 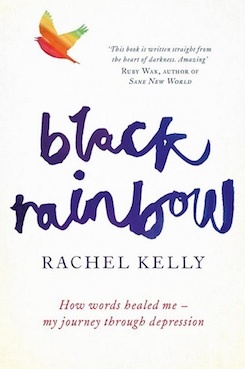 And it will help to read Rachel Kelly’s Black Rainbow." " An incredible book : brave, honest, absorbing -- highly recommended "